China and Laos on Monday agreed to build a community of shared future with strategic importance during Chinese President Xi Jinping's state visit to the Southeast Asian country. The two sides made the decision during a meeting between Xi, who is also general secretary of the Communist Party of China (CPC) Central Committee, and Bounnhang Vorachit, general secretary of the Lao People's Revolutionary Party (LPRP) Central Committee and president of Laos. It is the first visit in 11 years by a Chinese head of state and top CPC leader to Laos. Speaking highly of each other's development achievements, the two sides agreed to strengthen exchanges and mutual learning, and push forward China's reform and opening up and Laos' reform and renewal. The two countries will continue to hold the spirit of good neighbors, good friends, good comrades and good partners, consolidate the China-Laos traditional friendship, and strive to lift their long-standing and stable comprehensive strategic cooperative partnership to a new stage, they said. 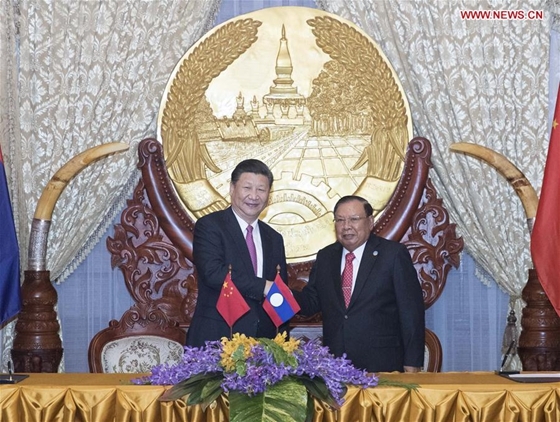 Xi praised Laos for sticking to a socialist path with its national characteristics and the country's great achievements in economic and social development. He stressed that he believes under the leadership of the LPRP Central Committee headed by Bounnhang, the Lao people will achieve greater achievements in their pursuit for comprehensive reform and renewal. For his part, Bounnhang spoke highly of the elevation of Xi Jinping Thought on Socialism with Chinese Characteristics for a New Era into the CPC's guiding principles during the 19th CPC National Congress. Bounnhang said he believes that under the leadership of the CPC Central Committee with Xi at the core, the Chinese people will forge ahead smoothly towards the two centenary goals. The achievements of the 19th CPC National Congress have greatly contributed to the development of socialist theories in a new era, and are conducive to peace, friendship, cooperation and development in the region and the world at large, he said. China and Laos are friendly socialist neighbors, with their time-testing traditional and good-neighborly friendship growing ever stronger, said Xi. Since they established diplomatic ties 56 years ago, the two sides have continuously enhanced political mutual trust and expanded practical cooperation. They have also seen their people-to-people exchanges grow increasingly closer, as well as a comprehensive and ever deepening bilateral relationship, which have brought substantial benefits to the two peoples, he said. China and Laos, who share similar dreams and beliefs, also have a far-reaching strategic relationship and broad space for cooperation, said the Chinese president. Noting that China has always cherished its traditional friendship with Laos and attached great importance to bilateral ties, Xi told Bounnhang that China is ready to join the Lao side to further enrich and develop their comprehensive strategic partnership of cooperation towards a higher level of mutual trust, mutual support and mutual benefit, so that the two will stay as good neighbors, good friends, good comrades and good partners. Bounnhang said he is confident that Xi's visit will draw a blueprint of and guide the building of a Laos-China community of shared future. Laos will firmly push forward the development of bilateral ties according to the "four-good" spirit and support China in playing a bigger role in promoting international and regional stability and prosperity, he said. Also at the meeting, the two leaders exchanged in-depth views on international and regional issues of common concern, and reached important consensuses. The two sides noted that the two countries are socialist states led by Communist parties. They agreed that jointly building a community of shared future with strategic importance based on mutual trust is in accordance with the fundamental interests and common expectations of the two parties, two countries and two peoples, and is also conducive to the noble cause of peace and development for mankind. Xi and Bounnhang also pledged that China and Laos will maintain the fine tradition of high-level exchange visits so as to guide the development of bilateral ties in the new era and strengthen inter-party exchanges and cooperation, deepen exchange of experience in the governance of the party and the state, and step up cooperation in diplomacy, defense, law enforcement and security. The two countries reaffirmed their firm support for each other's core interests and major concerns, agreed to accelerate the synergy of China-proposed Belt and Road Initiative and Laos' strategy of turning itself from a "land-locked" country to a "land-linked" one. They also agreed to jointly build a China-Laos economic corridor, forge ahead with signature projects such as the China-Laos railway, elevate the scale and standard of their economic and trade cooperation in a bid to promote economic complementarity of the two countries, and deepen cooperation in industrial capacity, finance, agriculture, energy, resource, water conservancy, telecommunication, infrastructure and health care, so as to better serve the general public of the two countries. The two leaders agreed to carry out closer coordination under multilateral frameworks including the United Nations, the Asia-Europe Meeting, East Asia Cooperation and Lancang-Mekong Cooperation mechanisms. Following the meeting, the two leaders witnessed the inking of a series of cooperation documents in various fields such as building the China-Laos economic corridor, digital Silk Road, electricity, science and technology. Before their talks, Bounnhang held a grand welcoming ceremony for Xi. Vientiane is the final leg of Xi's first overseas trip after the 19th CPC National Congress, which was held last month in Beijing. Prior to the Laos visit, he attended the 25th Asia-Pacific Economic Cooperation Economic Leaders' Meeting in Vietnam's central city of Da Nang and paid a state visit to the country.